Some air conditioning problems are simple to fix and require only a few minutes of your time. Examples include changing the filter if you’re getting inadequate airflow or checking to see that the thermostat is set for air. When the issues are more complicated, it’s best to contact our Wylie, Texas AC repair company right away rather than attempt to fix the problem on your own. 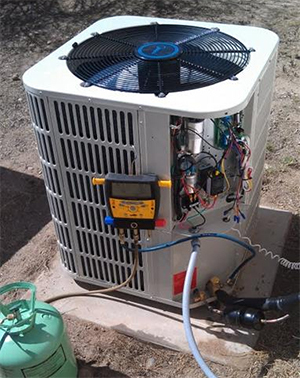 If the unit isn’t producing enough cool air or doesn’t turn on at all, it could be due to low levels of refrigerant fluid, a faulty thermostat, a broken compressor, or cracked fan blades. An air conditioner makes loud, sudden noises for a variety of reasons, including lack of refrigerant, loose wiring, or broken parts. A service call is definitely in order if the unexpected noises happen repeatedly. Leaking water or excessive condensation on the unit could indicate a potential emergency. If you ignore the problem, the water could back up into your house and cause flooding. When the air conditioner is working properly, condensation turns into water and drips into an attached pan. However, this can’t happen if the pan or the drain line is clogged with any type of debris. Air Conditioning Repair 7 Days A Week! Whether you need routine air conditioning repair or you are dealing with an emergency, the skilled service technicians at Kiwi AC & Heating are available to assist you. This includes days, evenings, late nights, weekends, and holidays for your convenience. To schedule a HVAC repair appointment for your home or business, please contact us today. We also encourage you to establish a preventative maintenance schedule.